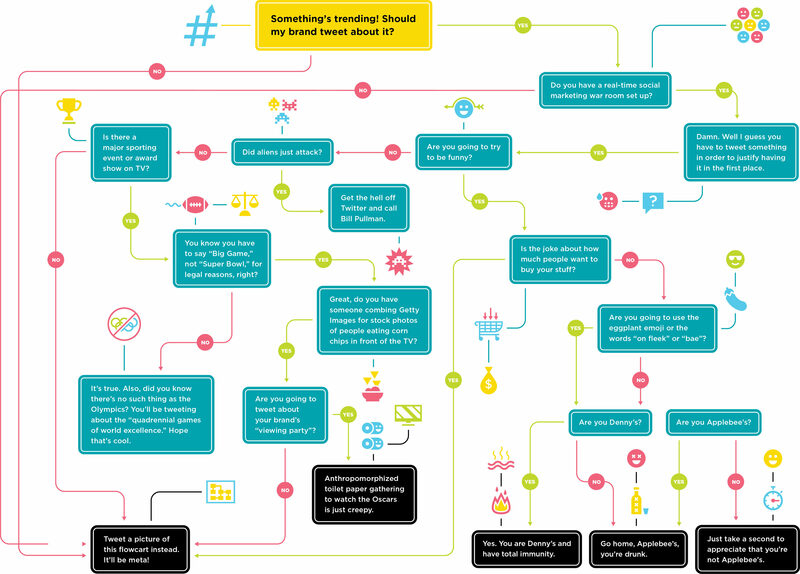 Flowchart: Should My Brand Hijack This Twitter Trend? Every day, a new Twitter hashtag magically emerges and fills our lives with something unexpected. Sometimes they’re funny, sometimes they’re a little dark and confessional, but they always seem to connect strangers. And every day, a brand comes along, sees those connections, and thinks: Oh yeah, it’s time to be a part of the #conversation. This usually doesn’t end well. At best, you’re Denny’s and manage to be hilarious and self-aware. At worst, you end up like these brands. So should your brand hijack the latest Twitter trend? Once you print this flowchart out and tape it to the forehead of your 23-year-old social media manager, you’ll never have to worry about a tweet gone wrong again. Click on the flowchart below to see it up close.